The English Department is hosting the National Book Foundation on April 9th. Every year, the National Book Foundation sponsors the National Book Awards, presenting coveted and prestigious prizes to some of the best writers in the USA. A reading and discussion by two National Book Award prize winners, poet Justin Phillip Reed, and novelist Angela Flournoy, will take place at 5 pm in Banquet Room B of the OC, on Tuesday, April 9th. Come hear these two major writers read from their writing and discuss cross-connections in their work. The reading is free and open to the public, and refreshments will be provided. After the panel, there will be a Q&A with the authors, and a book signing. In partnership with the National Book Foundation, presenter of the National Book Awards, the Wayne State University Department of English is pleased to present a conversation between two contemporary, award-winning writers, as a part of its Open Field Reading Series. Whether for reasons of race, class, sexuality, or other intersecting identities, the systems on which our society is meant to rely often fail to serve certain groups and individuals. How can fiction and poetry serve as an indictment of structural failure as well as a mode of reinforcing the community ties that sustain us? Join National Book Award Finalist and 5 Under 35 honoree Angela Flournoy (The Turner House) and National Book Award Winner Justin Phillip Reed (Indecency) for a conversation on the power of literature as both critique and comfort. ANGELA FLOURNOY is the author of The Turner House, which was a finalist for the National Book Award and a New York Times notable book of the year. The novel was also a finalist for the Center for Fiction First Novel Prize, the PEN/Robert W. Bingham Prize for Debut Fiction and an NAACP Image Award. She is a National Book Foundation "5 Under 35" Honoree for 2015. Her fiction has appeared in The Paris Review, and she has written for The New York Times, The Nation, The Los Angeles Times, and elsewhere. A graduate of the Iowa Writers' Workshop, Flournoy received her undergraduate degree from the University of Southern California. She has taught at the University of Iowa, The New School, Columbia University and Princeton University. Flournoy was the 2016-17 Rona Jaffe Foundation Fellow at the New York Public Library's Dorothy and Lewis B. Cullman Center for Scholars and Writers. She is a 2018 National Endowment for the Arts fellow. JUSTIN PHILLIP REED is an American poet living in St. Louis. He is the author of Indecency (Coffee House Press), winner of the 2018 National Book Award in Poetry and a finalist for the 2019 Kate Tufts Discovery Award, as well as the chapbook A History of Flamboyance (YesYes Books, 2016). His work appears in African American Review, Best American Essays, Callaloo, The Kenyon Review, Obsidian, and elsewhere. A three-time high school expellee and an ex-college dropout, he received his BA in creative writing at Tusculum College and his MFA in poetry at Washington University in St. Louis, where he served as Junior Writer-in-Residence. He has received fellowships from the Cave Canem Foundation, the Conversation Literary Festival, and the Regional Arts Commission of St. Louis. Reed was born and raised in South Carolina. This event will be hosted on the first floor of the Purdy Kresge Graduate Library, in the Kresge Auditorium (room 110). The moderated conversation and book signing will take place from 6:00-7:45p on Monday, April 8. BOOK GIVEAWAY courtesy of the National Book Foundation! 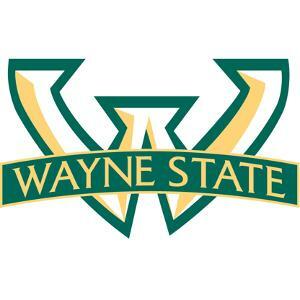 For more information about this event, please contact Connor Newton at 248.933.1644 or connor.newton@wayne.edu. Join us for a reading and Q&A at UCLA with award winning author in residence Angela Flournoy! Please join us for a reading and Q&A with award winning author in residence Angela Flournoy. Refreshments will be served. Hailed as an “assured and memorable novel” by the New York Review of Books, Flournoy’s book brings us a colorful, complicated brood full of love and pride, sacrifice and unlikely inheritances. It’s a striking examination of the price we pay for our dreams and futures, and the ways in which our families bring us home. The author will be reading excerpts from her debut novel, followed by a Q& A from the audience. Fiction First Novel Prize, the PEN/Robert W. Bingham Prize for Debut Fiction and an NAACP Image Award. She is a National Book Foundation “5 Under 35” Honoree for 2015. Her fiction has appeared in The Paris Review, and she has written for The New York Times, The Nation, The Los Angeles Times, and elsewhere. 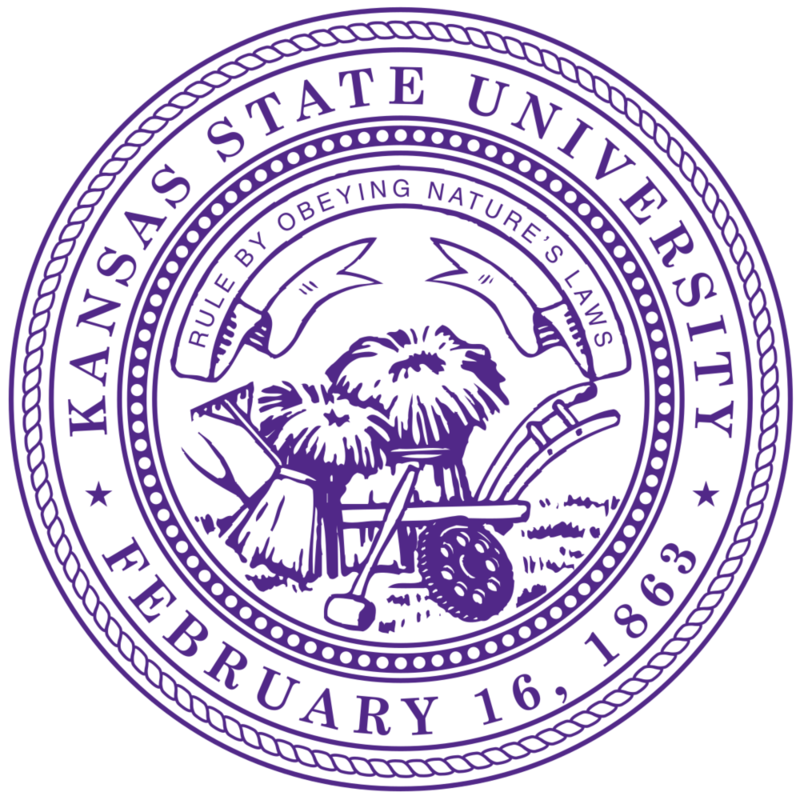 A graduate of the Iowa Writers’ Workshop, Flournoy received her undergraduate degree from the University of Southern California. She has taught at the University of Iowa, The New School, Columbia University and Princeton University. Flournoy was the 2016-17 Rona Jaffe Foundation Fellow at the New York Public Library’s Dorothy and Lewis B. Cullman Center for Scholars and Writers. She is a 2018 National Endowment for the Arts fellow. Join us on Friday October 26 for a reading by fiction writer Angela Flournoy! 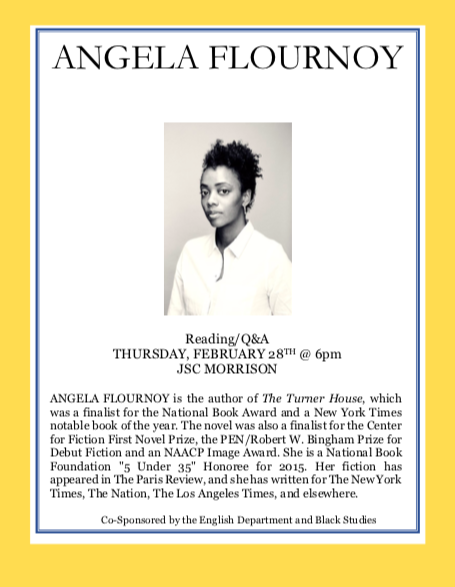 The Literaryswag Book Club returns with a conversation about Angela Flournoy's award winning novel, The Turner House. Angela Flournoy will join the meeting. The meeting is free and open to the public, and hosted by Yahdon Israel. SOLD OUT! 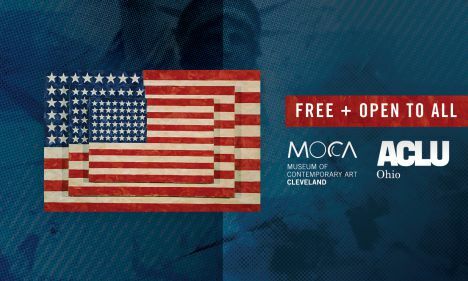 As part of the I Am America series, writers Terese Marie Mailhot and Angela Flournoy discuss how we reckon with the historical legacies that are handed down to us, and how they become part of our personal stories. The event will be moderated by our executive director, Noreen Tomassi. 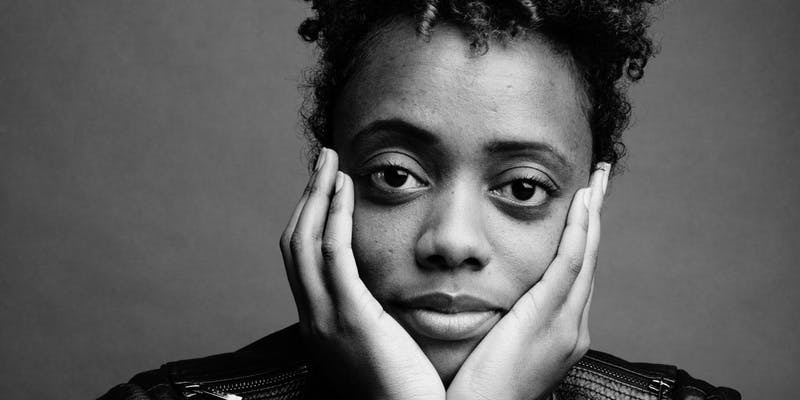 Angela Flournoy is the author of The Turner House, which was a finalist for the National Book Award and aNew York Times Notable Book of the Year. The novel was also a finalist for the Center for Fiction First Novel Prize, the PEN/Robert W. Bingham Prize for Debut Fiction and an NAACP Image Award. She is a National Book Foundation "5 Under 35" Honoree for 2015. Flournoy was the 2016-17 Rona Jaffe Foundation Fellow at the New York Public Library's Dorothy and Lewis B. Cullman Center for Scholars and Writers. She most recently taught at Princeton University. IT OCCURS TO ME THAT I AM AMERICA was published by Touchstone/Simon & Schuster in support of the American Civil Liberties Union (ACLU) upon the one-year anniversary of the Presidential Inauguration and the Women’s March on Washington. The book will be available for purchase in The MOCA Store during this event. A cash bar public reception will precede the talk. Jamel Brinkley is the author of A Lucky Man: Stories (Graywolf Press/A Public Space Books). His fiction has appeared, or is forthcoming, in The Best American Short Stories 2018, A Public Space, Ploughshares, Gulf Coast, The Threepenny Review, Glimmer Train, American Short Fiction, Epiphany, and LitMag. A graduate of the Iowa Writers’ Workshop, he was also the 2016-17 Carol Houck Smith Fiction Fellow at the Wisconsin Institute for Creative Writing. His work has received support from Kimbilio Fiction, the Callaloo Creative Writing Workshop, the Napa Valley Writers’ Conference, the Tin House Summer Workshop, and the Bread Loaf Writers' Conference. Beginning this fall, he will be a 2018-2020 Wallace Stegner Fellow in Fiction at Stanford University. Angela Flournoy is the author of The Turner House, which was a finalist for the National Book Award and a New York Times notable book of the year. The novel was also a finalist for the Center for Fiction First Novel Prize, the PEN/Robert W. Bingham Prize for Debut Fiction and an NAACP Image Award. She is a National Book Foundation "5 Under 35" Honoree for 2015. Her fiction has appeared in The Paris Review, and she has written for The New York Times, The Nation, The Los Angeles Times, and elsewhere. A graduate of the Iowa Writers' Workshop, Flournoy received her undergraduate degree from the University of Southern California. She has taught at the University of Iowa, The New School and Columbia University. Flournoy was the 2016-17 Rona Jaffe Foundation Fellow at the New York Public Library's Dorothy and Lewis B. Cullman Center for Scholars and Writers. She currently teaches at Princeton University. Angela will be joining the students of Bryn Mawr in the Goodhart Music Room on campus for an evening of reading, informal Q+A and book signing! This reading is free and open to the public. Join us for an evening of panel reading with Angela Flournoy at The Strand bookstore in Manhattan. Egg's Table of Contents Culinary Reading Series! Angela is excited to be taking part in Egg's culinary reading series alongside Carmen Maria Machado. Join us for a culinary reading, Q/A with the authors, and books sold by WORD in house! The Raymond Carver Reading Series features twelve to fourteen prominent writers yearly as part of a large undergraduate class taught by TAs from the Creative Writing Program. The readings have an extended Question and Answer session along with a reading. The public is welcome to attend. Recent authors include Gary Lutz, Sam Lipsyte, Brigit Pegeen Kelly, Terrance Hayes, C.K. Williams and Lydia Davis. Angela will be Syracuse University's Daniel and Jane Present Lecturer for the Raymond Carver Fall Series Reading. See SU's corresponding Arts & Literature article here! Click here for more information on the reading series. Reading and Q&A presented by the Program in Creative Writing at the College of New Rochelle. Jack Jones Literary Arts is hosting its first annual writing retreat at SMU-in-Taos in Taos, New Mexico. This two-week retreat will be held October 12- 26, 2017, and is open exclusively to women of color. Angela is the 2017 Jack Jones Retreat Writer-in-Residence in Fiction. 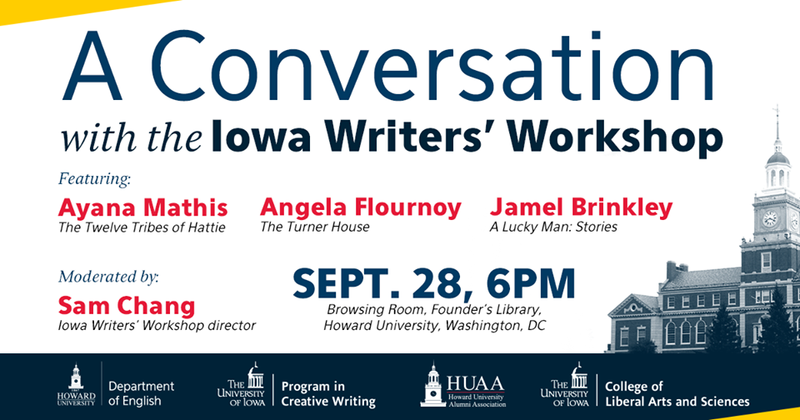 "An Evening with the Iowa Writers' Workshop," at Howard University in Washington, D.C. Angela will be participating in the panel and reading. The Workshop is planning to Co-Sponsor the evening event with the Howard Alumni Association. At Reparations, Live!, Morgan Parker invites some of today’s brightest thinkers and makers to tell us what America owes them, and brainstorm the infinite paths to getting paid. Angela will be a guest alongside Michael Arceneaux, Angel Nafis and Nate Marshall. In conversation with Hannah Tinti at the auditorium at St. Francis College (downtown Brooklyn on Remsen Street). Meet & Greet with Conversation about The Turner House. Meet & Greet with Conversation about The Turner House at the Langston Hughes Performing Arts Institute. Craft Talk. This event is ticketed. Keynote Address for the "Intersections: Understanding Urbanism in the Global Age" Conference. Registration is required.